Helmand ( ; Pashto/Dari: هلمند), also known as Hillmand, and, in ancient times, as Hermand and Hethumand is one of the 34 provinces of Afghanistan, in the south of the country. It is the largest province by area, covering 58,584 square kilometres (20,000 sq mi) area. The province contains 13 districts, encompassing over 1,000 villages, and roughly 879,500 settled people. Lashkar Gah serves as the provincial capital. Helmand was part of the Greater Kandahar region until made into a separate province by the Afghan government in the 20th century. The province has a domestic airport (Bost Airport), in the city of Lashkar Gah and heavily used by NATO-led forces. 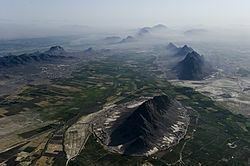 The British Camp Bastion and U.S. Camp Leatherneck are a short distance southwest of Lashkar Gah. The Helmand River flows through the mainly desert region of the province, providing water for irrigation. The Kajaki Dam, which is one of Afghanistan's major reservoirs, is located in the Kajaki district. Helmand is believed to be one of the world's largest opium-producing regions, responsible for around 42% of the world's total production. This is believed to be more than the whole of Burma, which is the second largest producing nation after Afghanistan. The region also produces tobacco, sugar beets, cotton, sesame, wheat, mung beans, maize, nuts, sunflowers, onions, potato, tomato, cauliflower, peanut, apricot, grape, and melon. The term "Helmand civilization" was proposed by M. Tosi. This civilization flourished between 2500 BC and 1900 BC, and may have coincided with the great flourishing of the Indus Valley Civilisation. This was also the ﬁnal phase of Periods III and IV of Shahr-i Sokhta, and the last part of Mundigak Period IV. "... the pottery of Mundigak I, the earliest occupation of the “Helmand” cultural complex, corresponds to the Mehrgarh III pottery, in technique — quality of the paste and manufacture — as well as in the shapes and decoration, probably within a phase dated to the end of the 5th millennium [BC]." Some Vedic scholars (e.g. Kochhar 1999) also believe the Helmand valley corresponds to the Sarasvati area mentioned in the Rig Veda as the homeland for the Indo-Aryan migrations into India, ca. 1500 BC. Helmand was inhabited by ancient peoples and governed by the Medes before falling to the Achaemenids. Later, the area was part of the ancient Arachosia polity, and a frequent target for conquest because of its strategic location in Asia, which connects Southern, Central and Southwest Asia. The Helmand river valley is mentioned by name in the Avesta (Fargard 1:13) as Haetumant, one of the early centers or origins of the Zoroastrian faith, in pre-Islamic Afghan history. However, owing to the preponderance of non-Zoroastrians before the Islamization of Afghanistan – particularly Hindus and Buddhists – the Helmand and Kabul regions were also known as "White India" in those days. It was invaded in 330 BC by Alexander the Great and became part of the Seleucid Empire. Later, it came under the rule of the Indian emperor Ashoka, who erected a pillar there with a bilingual inscription in Greek and Aramaic. The territory was referred to as part of Zabulistan and ruled by the sun-worshipping Hindus Zunbils before the Muslim Arabs arrived in the 7th century, who were led by Abdur Rahman bin Samara. It later fell to the Saffarids of Zaranj and saw the first Muslim rule. Mahmud of Ghazni made it part of the Ghaznavids in the 10th century, who were replaced by the Ghurids. Helmand was the center of the USAID program in the 1960s to develop the Helmand and Arghandab Valley Authority (HAVA) – it became known locally as "little America". The program laid out tree-lined streets in Lashkar Gah, built a network of irrigation canals and constructed a large hydroelectric dam. The development program was abandoned when pro-Soviet Union forces seized power in 1978, although much of the province is still irrigated by the HAVA. In Autumn 2006, British troops started to reach "cessation of hostilities" agreements with local Taliban forces around the district centers where they had been stationed earlier in the summer. Under the terms of the agreement, both sets of forces were to withdraw from the conflict zone. This agreement from the British forces implied that the strategy of holding key bases in the district, as requested by Afghan President Hamid Karzai, was essentially untenable with the current levels of British troop deployment. The agreement was also a setback for Taliban fighters, who were desperate to consolidate their gains in the province, but were under heavy pressure from various NATO offensives. 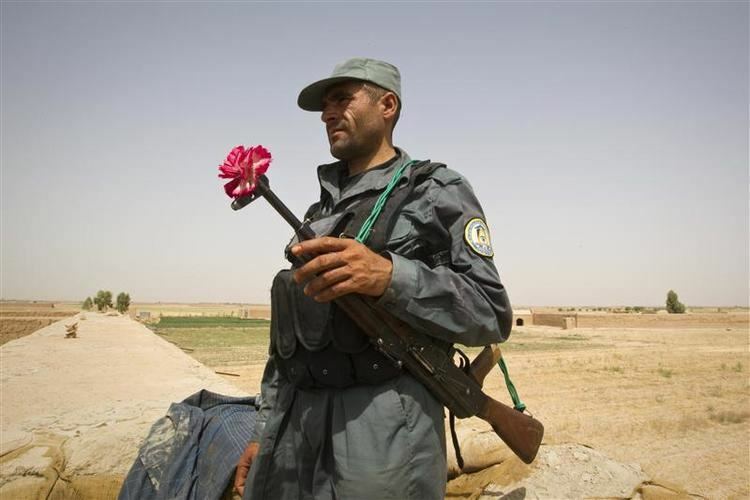 News reports identified the insurgents involved in the fighting as a mix of Taliban fighters and warring tribal groups who are heavily involved in the province's lucrative opium trade. Given the amount of drugs produced in the area, it is likely that foreign drug traffickers are also involved. Fighting continued throughout the winter, with British and allied troops taking a more pro-active stance against the Taliban insurgents. Several operations were launched including the more recent Operation Silicone at the start of spring. In May 2007, Mullah Dadullah, one of the Taliban's top commanders, along with 11 of his men were killed by NATO-led Afghan forces in Helmand. In June 2009, Operation Panther's Claw was launched with the stated aim of securing control of various canal and river crossings and establishing a lasting ISAF presence in an area described by Lt. Col. Richardson as "one of the main Taliban strongholds" ahead of the 2009 Afghan presidential election. In July 2009, around 4,000 U.S. Marines pushed into the Helmand River valley in a major offensive to liberate the area from Taliban insurgents. The operation, dubbed Operation Khanjar (Operation Dagger), was the first major push since U.S. President Obama's request for 21,000 additional soldiers in Afghanistan, targeting the Taliban insurgents. In February 2013, BBC reported that corruption occurs in Afghan National Police bases, with some bases arming children, using them as servants and sometimes sexually abusing them; in early March 2013, the New York Times reported that government corruption is rampant with routine accusations against the police of shaking down and sexually abusing civilians causing loyalty to the government to be weaker. The current Governor of the province is Mirza Khan Rahimi. 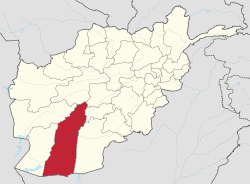 The city of Lashkar Gah is the capital of Helmand province. All law enforcement activities throughout the province are controlled by the Afghan National Police (ANP). Helmand's border with neighboring Balochistan province of Pakistan is monitored and protected by the Afghan Border Police (ABP), which is part of the ANP. The border is called the Durand Line and is known to be one of the most dangerous in the world due to heavy militant activities and illegal smugglings. A provincial Police Chief is assigned to lead both the ANP. The Police Chief represents the Ministry of the Interior in Kabul. The ANP is backed by other Afghan National Security Forces (ANSF), including the NATO-led forces. The overall literacy rate (6+ years of age) increased from 5% in 2005 to 12% in 2011. The overall net enrollment rate (6–13 years of age) fell from 6% in 2005 to 4% in 2011. The population of Helmand Province was reported at 879,500 in the year 2013. It is mostly a tribal and rural society, with the native ethnic Pashtuns being the majority, followed by Baloch, Tajiks, Hazaras and others as the minority. There may also be small number of Hindus and Sikhs who run businesses in the provincial capital, Lashkar Gah. The Pashtuns are divided into the following tribes: Barakzai (32%), Nurzai (16%), Alakozai (9%), and Eshaqzai (5.2%). All the inhabitants practice Sunni Islam except the small number of Hazaras who are Shi'as and the Sikhs who follow Sikhism.